This is an edition of Jules Renard’s Histoires naturelles translated by the late Douglas Parmée and with illustrations by Pierre Bonnard. Parmée died in 2008; his introduction to the book gives the impression of having sat on the shelf for a while. 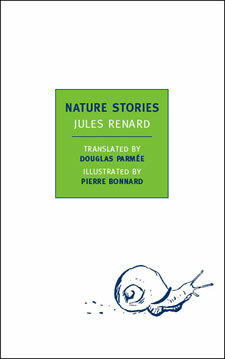 NYRB presumably took advantage of the good feeling engendered by Tin House’s republication of Renard’s Journal in 2008 as an excuse for publishing this volume; another version of this book seems to be out from Oneworld Classics in the translation of Richard Stokes with illustrations by Lucinda Rogers. I haven’t seen that version, though I’d like to; Parmée’s introduction indicates that he selectively reworked Renard’s text to work better in English, and the NYRB edition is much longer than the Oneworld version. Two earlier editions of this book appeared in English in 1966: George Brazilier published a translation by Elizabeth Roget in 1966, and the Horizon Press published one by Richard Howard; both featured illustrations by Toulouse-Lautrec and seem to have largely vanished. What inspires such bursts of publication is unclear to me. But even among this year’s crop of translations, the Parmée and Stokes translations aren’t, for what it’s worth, the most interesting edition of this book; that would be a limited Italian edition with illustrations by Luigi Serafini, the existence of which has the unfortunate side effect of making this particular edition seem rather cheaper than it should. it’s hard to tell how we should read the trailing comma. Is this unfinished? Is this an editorial mistake? (My edition is an uncorrected proof.) Or is it possible that Renard intended this for publication? As printed, this can be read as poetry; it’s much harder to read this as prose. Knowing Ponge, we can read this Renard as a precursor; but it’s not clear to me that this is what Renard would have intended. This couple of young birds has already started living together on their own. I come on them one evening at the edge of a ploughed field. They were so tightly joined, one wing on top of the other, so to speak, that the shot which killed one dislodged the other one. The female didn’t feel anything but the male just had time to see his bride dead and to feel himself dying beside her. The two of them have left, in the same place, a little love, a little blood, a few feathers. Though it isn’t necessarily clear from this quote, the birds have almost certainly been shot by the narrator himself: he sees what he has done and anthropomorphizes in the name of empathy. But it’s the last line here that might count: the narrator seems to be upbraiding himself for his hubris, for he’s only really managed to kill two birds at once by accident. The conflict is what makes this book interesting; it’s not the achievement that Renard’s Journal is, and this edition leaves something to be desired, but it’s a pleasant and entertaining book. This entry was posted in reviews and tagged jules renard. Bookmark the permalink.